The Festival begins with the opening of a new installation Hiding by Rose Borchovski – an installment of the Susa Bubble story – on the south east corner of Odyssey. 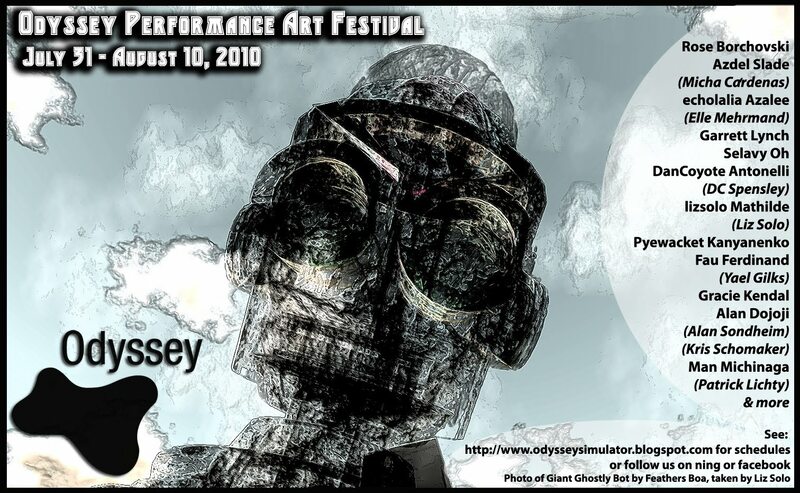 The Artist will be in attendance. The performance continues ideas of the artist, identity and being from the works “Between Saying and Doing” and “On Exactitude of Similitude”. The artist, wearing his now usual sandwich board, generates two hundred visually identical sandwich boards for participants to wear while all but taking control of the chat window to focus discussion on topics including identity, location, representation, original and copy, ‘reality’ and fiction. 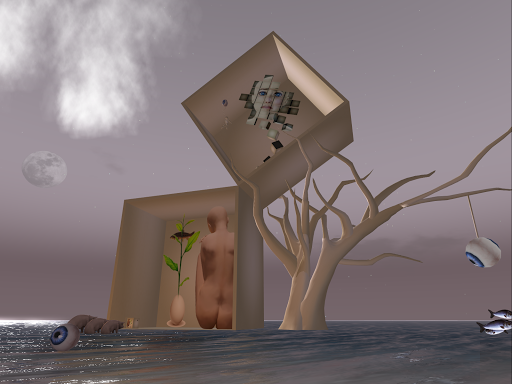 Performance by lizsolo Mathilde and Fau Ferdinand taking place in lizsolo’s virtual garden and simultaneously in her east coast backyard. “The Hansen-Ono Piano Method”, is an extension of Al Hansen’s historic FLUXUS work “Yoko Ono Piano Drop”, in which Al Hansen dropped a piano off of a building as an action for his colleague, Yoko Ono. In this action, Lichty’s avatar (Man Michinaga) sits at the piano, while rains of pianos, anvils, sheep, and other whatnot rain down with cacaphanous results. This event is a Loft Opening and Live Performance taking place in Ze’s loft space at the Odyssey Artists Residence. Ze Moo opens his Lofts Studio with a performance. Previous Post virus. circus. breath.